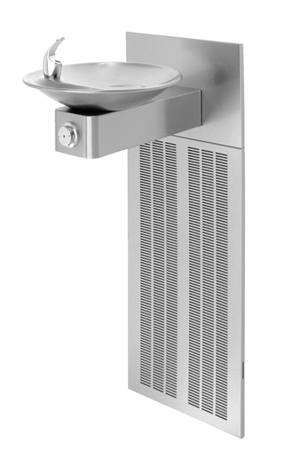 Barrier Free electric drinking fountain provides 8 gph chilled water performance in an engineered stainless steel skin. Its patented stainless steel push-button valve assembly allows for front access stream adjustment and cartridge and strainer access. Outfitted with a protective vandal resistant bubbler head, waste strainer, bottom plate, and an integral basin shank and inserted roll pin, this drinking fountain is highly vandal resistant. Designed to run at a low energy usage, this water cooler and fountain are assured to have a long lasting life. Laminar flow prevents splashing and the beautiful satin finish resists staining and corrosion keeping the drinking area contained and clean. Stainless steel back panel helps to protect the wall from inadvertent splashing, and its decorative satin finish increases location visibility and completes the fountains attractive appearance. Polished chrome-plated brass bubbler head with integral laminar flow prevents splashing and provides a superior flow pattern. Shielded angled stream orifice produces a steady sanitary source of water. Model H1001.8 Series meets current Federal Regulations for the disabled including those in the Americans with Disabilities Act. Haws manufactures drinking fountains, electric water coolers and electric drinking fountains to be lead-free by all known definitions including ANSI/NSF Standard 61, Section 9, California Proposition 65 and the Federal Safe Drinking Water Act. 18 gauge Type 304 Stainless Steel bowl assembly mounted on a 14 gauge Type 304 Stainless Steel wall bracket. Grille slots are designed to eliminate sharp edges and are backed with a foam filter to protect the fan motor and high displacement compressor from debris.